John: There where Kaplan’s store was located, did it get into the building? John: And you gentlemen, where were you and how did it affect you at the height of the flood? Charlie: I didn’t live in town, so I wasn’t affected, but I do remember Harv Brant moving his boat out. He lived in the lock house. He moved his piano out on a skiff. If that thing had moved one way or the other it would have sunk. You had canal boats sitting there between the lockhouse and the cemetery and it took those away. John: Yes, there were some canal boats in the basin even though the canal had gone out of business. It took most of those or all of those. Charlie: The two of them. Maurice: We went up to the cemetery at Doubleday Hill and looking at the height of it, and the time the height of it at the Cushwa building was if I recall 49 ½ feet of water in the river coming down. 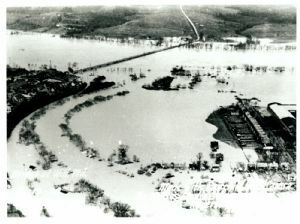 The height of the flood was 49 ½ feet of water. From Doubleday Hill looking at the river we saw straw stacks coming down the river and chickens on top of straw stacks. The question we always tried to find out – what happened to the chickens? Did they jump off on the bridge, go on down the other side? We don’t know. But the scene from Doubleday Hill, looking upriver, the river was just loaded with trash. And over where Ms Mary Mish lived, which is the river bridge going across water was on the other side, it went over the bridge. John: Did it go over the bridge? John: I knew it got right up to it. How about you sir? Where were you? Bob: I didn't live in Williamsport at the time, but Dad brought us over. I remember seeing several buildings going down the river. And they seemed to be basically upright, with the peak of the roof up, with chickens on the top. To me, as a kid, the water ferocity was scary. And that amount of water, the height that it gained on the buildings round here, it's something I never forgot. The participants in the discussion were Sue Hoch, Robert May, Jack Myers, Charles South, and Maurice Snyder. John Frye was the interviewer. Also present were Joan and Gerry Knode of the Williamsport Town Museum, who coordinated up the interview session, and Marie and Kevin Gilbert of the Hagerstown Herald-Mail.